Maybe, as you drive the M74 between Gretna and Glasgow or look out from the train, you have noticed the hills of the Scottish Lowlands. A quite different landscape to that of the Highlands, the hills are less rocky, more rounded and with walls and fences as evidence of their agricultural use. And they are a little lower. But these easily accessible hills offer good walking and great days out and for most, with far easier access. And walking the hills isn't the only option. Mountain biking is flourishing with trails being built in the forests across the Lowlands. Graded for difficulty, these attract riders of all ages and abilities. The Isle of Arran is better known as a hillwalking destination; each year many thousands take the ferry from Ardrossan to walk Goatfell. But the island offers much more, from the less frequented peaks elsewhere in the northern 'highlands' to the evidence left behind by neolithic settlers. 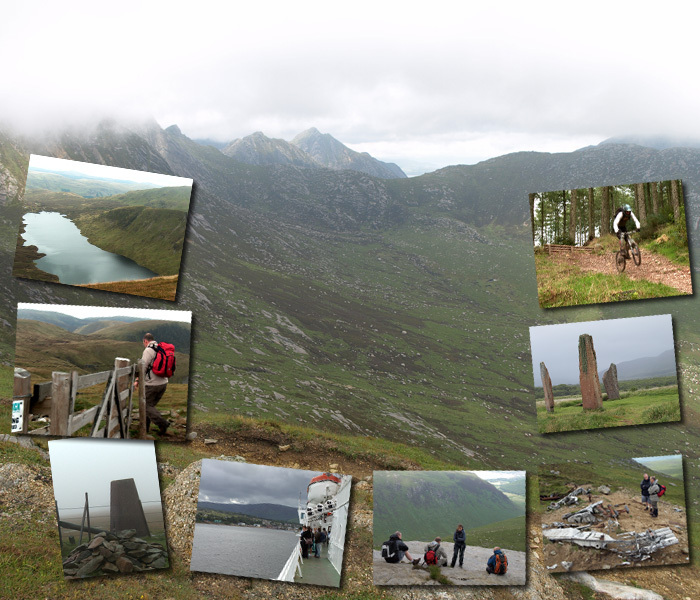 We have made the Scottish Lowlands DVD for you to sample the Lowlands and Arran, enjoy the scenery and views, and maybe try the routes we walked. To be inspired by these stunning landscapes, please click here for the DVD.